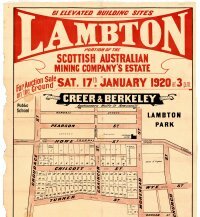 The University of Newcastle Cultural Collections photo archive on Flickr contains over 800 historical real estate sale maps. 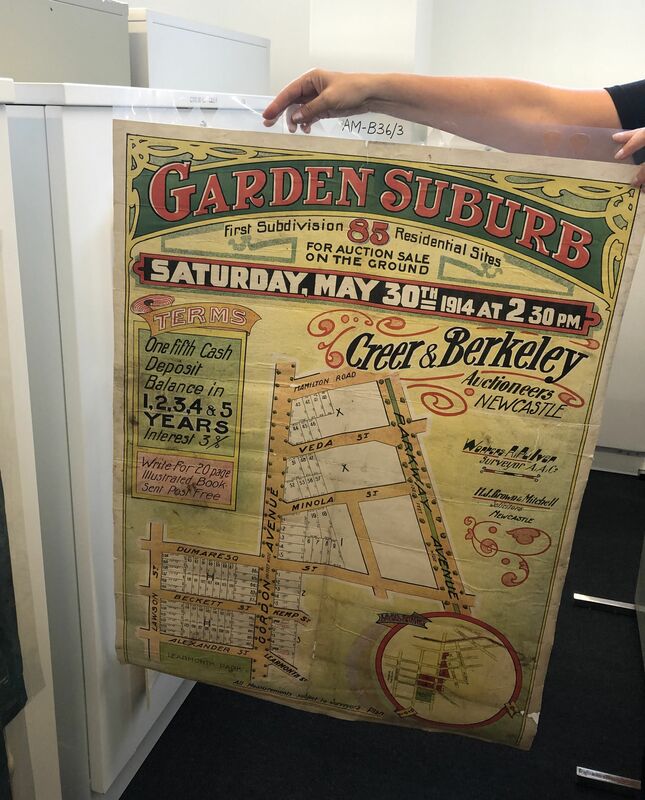 The National Library of Australia also has a collection of real estate sale posters from Creer and Berkeley, of which about 130 are not in the University of Newcastle archives. To make these maps easier to locate, I have constructed a ‘visual index’ using Google Maps. Click on a shaded area in the map below to see links to map images for that area. You can also view the visual index in full-screen mode. What’s the use of these maps? Identifying when particular suburbs/subdivisions/streets were developed. e.g. Garden Suburb in 1918. Providing insight into the naming of streets. e.g. given that this subdivision in Jesmond/Wallsend was done in 1919, it’s a fair assumption that Victory Parade was named in honour of the Allied victory in World War 1. Showing where rivers and creeks have changed course. e.g. a long gone branch of the Hunter River flowing into Throsby creek. This map is a visual index only intended to aid in locating relevant maps for a particular area. The shaded areas are not meant to be an accurate survey. The visual index includes maps in the Cultural Collections photostream from the Newcastle/Lake Macquarie/Port Stephens area. The index doesn’t include (yet) places from further afield like Katoomba or Cessnock. The index also doesn’t include wide area maps like. Platt’s Estate 1912 as these would clutter the index map too much. The list of images not indexed yet is here. The same or similar area was up for sale in different years. Where there are multiple maps covering the same area I have sometimes trimmed the shaded clickable areas in order to avoid having overlaps. Some maps are split into two or more clickable areas on the index, to avoid too many overlapping areas. e.g Mayfield in 1921. I have labelled the title of each area with the modern suburb name, not the original suburb name. e.g. Mayfield West rather than Waratah. Where the shaded area overlaps multiple suburbs I have labelled it with the suburb that the land mainly is located in. Although almost all the historical maps could be reliably located in the modern Google Maps, sometimes this was problematic, and in these cases I’ve made a best guess at locating the land. e.g. Sparke Street Georgetown in 1924. While most maps match what currently exists in the landscape, there are some examples of subdivisions that never made it into reality. The most notable example is Pindimar City on the north shore of Port Stephens. Another example is the Ramsgate subdivision on the southern shores of Lake Macquarie. I’ve been making use of these real estate maps for three or four years now, and never realised how big they were. I had just assumed they were about A4 or A3 size, but in the Local Studies section of Newcastle Library today I saw some of these posters in the flesh, and they are indeed poster sized. Excellent work Lachlan. I’ve shared this page in the Lost Newcastle group on Facebook. Thanks for that. This index has been mentioned on the Lost Newcastle group before, but its probably useful to do so again. You might find some real estate maps (aka subdivision plans) you have not already seen in the collections of the State Library of New South Wales. Search the catalogue (https://primo-slnsw.hosted.exlibrisgroup.com/primo-explore/search?vid=SLNSW&tab=default_tab) with the phrase “subdivision plans” and the name of a Newcastle suburb, and you will find even more. The State Library’s Sydney subdivision plans have all been digitised, and the subdivision plans relating to regional New South Wales are to be digitised soon.